In a new working paper–The Influence of History on States’ Compliance with Human Rights Obligations—we argue that scholars studying human rights could learn a lot from development economics. There are considerable differences in countries’ levels of respect for human rights. Human rights scholars trying to explain these differences have focused on current variables. These current variables include things like whether countries have ratified international agreements or included specific protections in their constitutions. There are also considerable differences in countries’ levels of wealth. Development economists trying to explain these differences have focused on the influence of history. For example, development economists have examined the influence of geographic factors, technological adoption hundreds of years ago, and the development of high-quality institutions centuries ago on countries’ current GDP. If the legacy of history is a powerful predictor of economic differences between countries, it follows that history should explain the differences in countries’ respect for human rights. The graphs above illustrate this point. The graph on the left plots countries based on their latitude and GDP Per Capita in 2010. As the graph clearly shows, there is a strong, positive relationship between these two variables: countries further from the equator are wealthier. 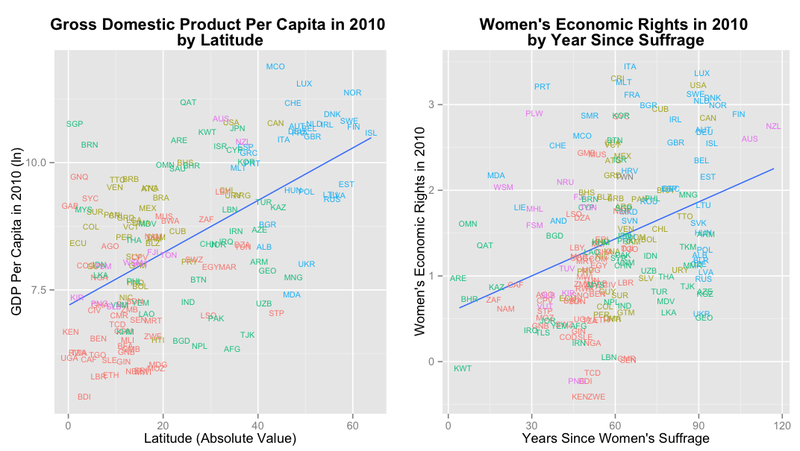 The graph on the right plots countries based on the number of years since they adopted women’s suffrage and their current levels of women’s economic rights (this data is from the widely used CIRI human rights dataset). Once again, there is a strong, positive relationship: the same countries that respected women’s rights a hundred years ago respect women’s rights today. In our paper, we develop this argument by testing the relationship between historical variables used in the development literature and current human rights practices. The results provides evidence suggesting that a number of the variables from development economics are powerful predictors of respect for human rights. If you’d like to learn more about our argument, method, or results, the paper is now available on SSRN.